The first week of classes, during which all time is wasted by reading through the syllabus. These definitions rang true for my peers and me—we regarded the first week of class as a time to have fun and relax before real school began. I would not pay much attention to my professors during this week, as the first class periods almost always consisted of tedious overviews of even more tedious documents—bland, all-text, two- to four-page syllabi. Students’ lack of excitement for syllabus overviews poses a problem for professors, as it limits their ability to convey important information about the course. In order to engage students on the first day of class, professors must rethink the form of the syllabus and take advantage of its potential to communicate material in a compelling, comprehensive way. Professors, if you are interested in reclaiming the first day of class from distracted students, read on to learn about three visual syllabi templates created in Lucidchart that are available for your use. A simple form that you can adopt for your syllabus is that of the organizational chart. Just as the traditional org chart reflects relationships between people within a company, categorizing them based on team and rank, the repurposed org chart syllabus breaks up a course into conceptual segments and displays the hierarchy between big-picture concepts and specific aspects and examples. Hierarchical organization: In lieu of information about a company’s CEO, you can fill the top node of this org chart with the name of your course or the central question or theme that you would like to drive the semester. You can then populate the middle layers of nodes with information about the different units and topics dividing your course, and fill the final layer with specific assignments or notes related to each topic. Neat, chronological organization: The org chart syllabus clearly displays the chronological structure of a course. You can arrange units and topics from left to right based on their date ranges, and choose to organize assignments horizontally or vertically beneath their corresponding sections. You can also color code the shapes in your chart to distinguish between different sections. As a result of these features, the org chart syllabus is clean in appearance and easy for students to follow. Customizable fields: In the template I have created, each node of the org chart contains two fields: title and date. However, you can easily change these fields, or add more, through Lucidchart’s org chart settings. You can even insert images into your nodes to make the diagram more interesting! The mind map syllabus is conceptually similar to the org chart—it is a branching, hierarchical diagram that reflects the relationships between a system’s components. 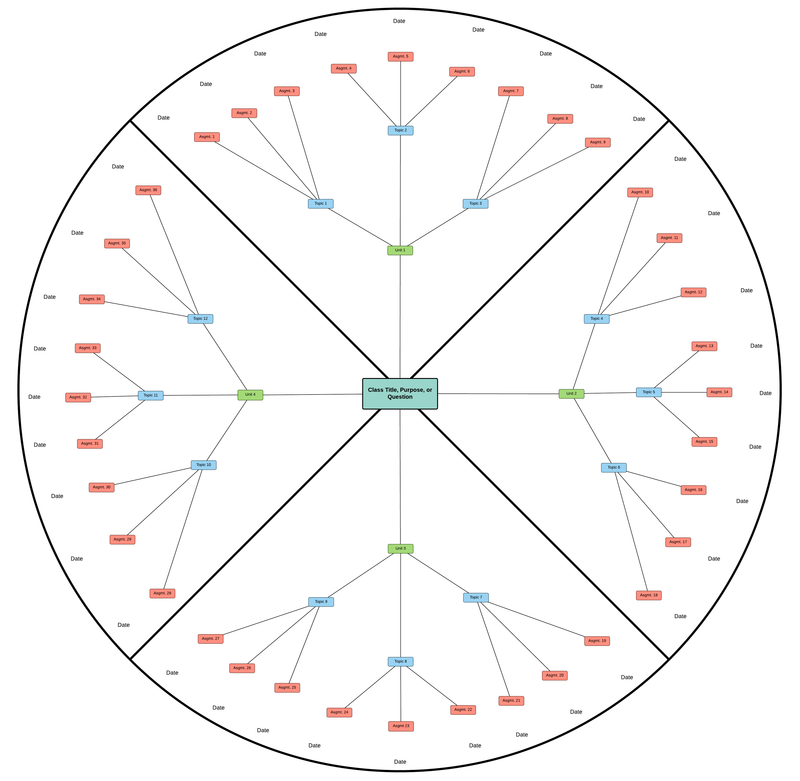 That said, the centralized, circular structure of this diagram renders it uniquely suited for representing curriculum that is unified by a central theme. This diagram is divided into parallel sections that shoot out from the center, a structure that reflects how the central theme can be examined from many different angles. Hierarchical organization: The hierarchical structure of the mind map is nearly identical to that of the org chart; however, instead of progressing from top to bottom, the mind map’s hierarchy evolves from the inside out. You can put the driving question or theme of your course at the center of the diagram and then use the outer layers of nodes to demonstrate the progression from this center through units and topics to specific assignments. 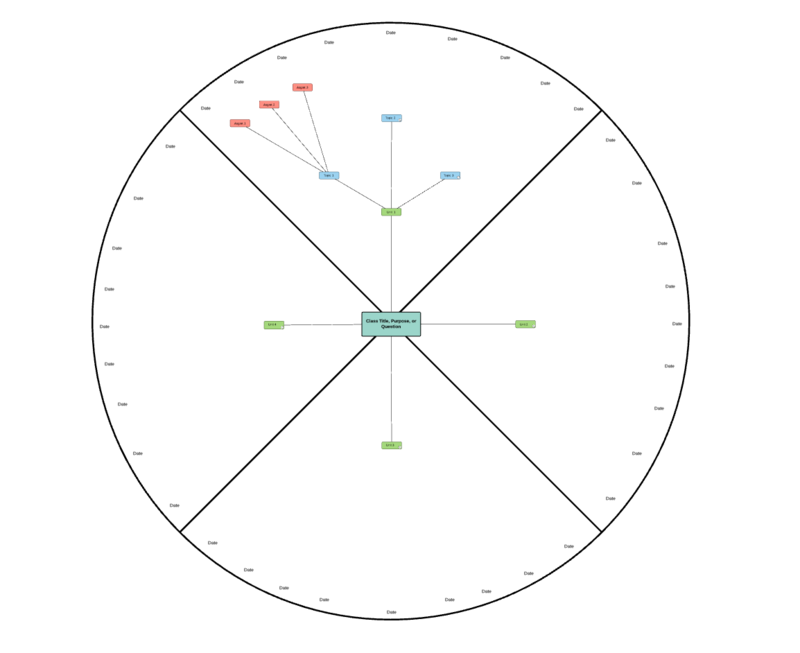 Unique chronological structure: Instead of depicting the progression of a semester from left to right, this template displays time passing in a circular way, similar to a clock. The top segment of the diagram represents the first unit of a course, the first assignment indicated by the pink node in the left corner of the section. Collapsable layers: When you use the mind map template, you can collapse or expand different parts of your diagram to highlight relevant portions. To do this, simply click on the parent node whose children you’d like to collapse and press “Z” on your keyboard. You can share this trick with your students so that they can focus on the unit, topic, or assignment at hand without being distracted by the rest of the diagram. This final syllabus template is conceptually very different from the previous two. Instead of following a hierarchical organization displaying the relationship between general ideas and specific instances, the roadmap template is organized around the chronology of a course and the order and importance of assignments. This template is great for an assignment-heavy class, as it helps students visualize the entire semester and the expectations you will have for them throughout. Chronological, day-by-day organization: Each circle in the roadmap template indicates a day of class and contains information about the work that is due on that day. Larger circles indicate important assignments or events that will impact a student’s grade. When students interact with this syllabus, they will be able to visualize their progress during the semester and see how far they are from any upcoming assignments. Visual indication of assignment’s weight: When you use the roadmap template, you can display the relative weight of each assignment to highlight the greatest demands of the course and help students prioritize their time. For instance, the “Final Exam” circle at the end of the template is about twice as large as any of the other circles, indicating that it will have a relatively heavy impact on students’ grades. Clear divisions based on units: Since the roadmap is organized chronologically, it invites easy visualization of unit divisions. Edit the color-coded background shapes of this template to reflect how your course will be broken up into smaller sections. Compatible with other syllabus types: Since the roadmap syllabus is organized based on chronology rather than a conceptual hierarchy, you can use it in association with an org chart or mind map syllabus. There’s no longer an excuse to present your class with a boring syllabus. Using Lucidchart, you can transform your traditional first-day document into a beautiful, interesting, and versatile visual aid that will excite your students and help them stay on track throughout the semester. Furthermore, your Lucidchart syllabus is easily shareable with students and can function as a hub of resources, as you can integrate links into your diagram that can guide students to external pages. And the best part? Lucidchart offers free educational accounts to students and teachers everywhere! Contribute to the excitement of syllabus week by customizing a visual syllabus in Lucidchart today! 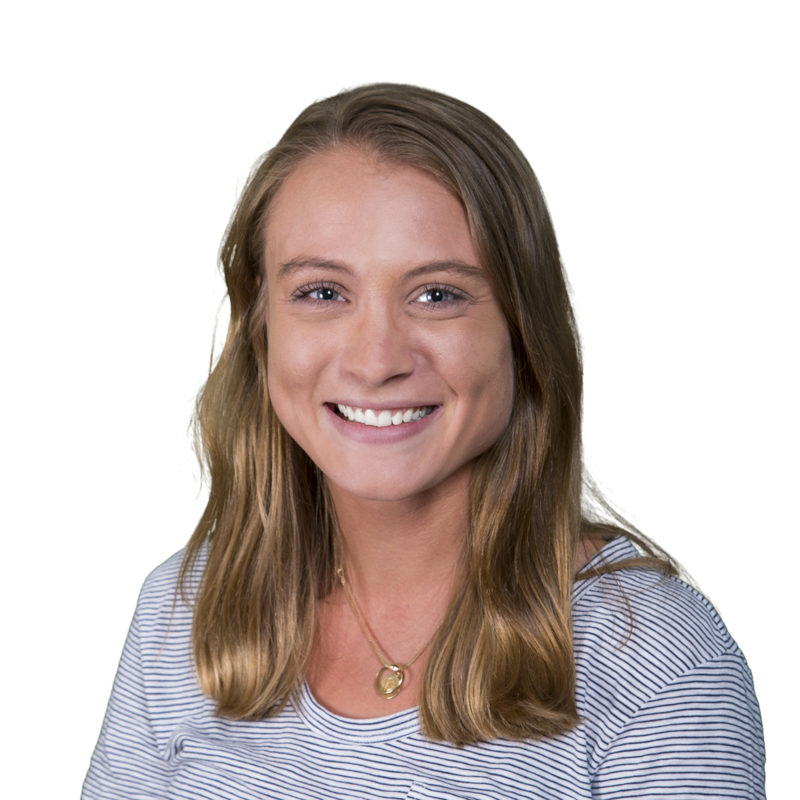 San Francisco native and recent English graduate of the University of Michigan, Annika Wildenradt is now working as a content specialist on the customer ops team at Lucid. Outside of work Annika likes to travel, bake pies, write stories for kids, and paint pictures of make-believe creatures and worlds.